Whether for a special holiday, as a token of gratitude or just a way of letting someone know you care, gift-giving is a universal custom. Though the intent may be similar from place to place, traditions vary widely from one country to the next. A gesture that conveys respect in one place might be considered offensive somewhere else. Take a look at our list of unique gifting traditions from around the world. The Japanese place a great emphasis on the act of gift giving (it’s not unheard of to send a thank-you gift for a thank-you gift), and presentation plays a big role in determining how your gift is received. For example, it’s considered distasteful to hand off uncovered cash. So whether you’re sending money as a gift or just leaving a tip, place your money in an envelope to ensure it’s received in a respectful manner. Chinese New Year has a rich set of traditions. 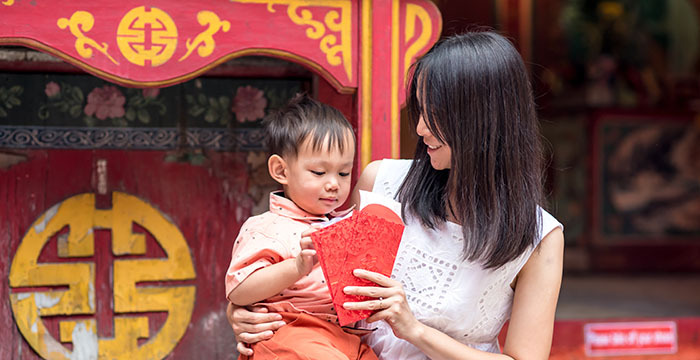 One of the most popular customs of this holiday is giving out money in red envelopes. Known as “yasuiqian” which means “the money used to suppress the evil spirit,” these gifts are meant to bring good luck. In addition to how you give money, there’s also superstition around the amount you give. Gifting an odd numbered amount of money is associated with the “baijin,” gifts given during funerals, and is considered bad luck. It’s important to make sure that even the first digit is even, as numbers like 30 and 50 are considered odd. Weddings are the source of many unique traditions. Giving a gift at an Armenian wedding means you get a little something back. The godmother of the bride or groom is responsible for collecting gifts of cash, and offer dried fruits and nuts in return as a token of gratitude. Here in the U.S., a set of kitchen knives seems like the perfect gift idea for a wedding or holiday. However, in certain European countries like Germany, superstition dictates that a knife presented as a gift will sever your friendship. There is a way to beat this superstition: Tie a penny to the knife or gift box. The receiver then returns the penny to you as a “payment” to nullify the bad luck. In Trinidad & Tobago, it’s customary to celebrate the birth of a newborn baby by placing money in its hand. This gesture conveys best wishes for the child’s healthy and prosperous upbringing. There’s a well-known Italian wedding tradition where the groom’s tie is cut into a number of tiny pieces. Wedding guests can then “buy” these tie slices in exchange for cash. It’s a fun way to give money to the bride and groom that leaves guests with a wedding souvenir. These are just a handful of the many unique gift giving customs around the world. Traditions also vary by religion and regions within countries. If you’re unsure, do some research on the local etiquette to avoid making a faux pas. Thankfully, sending money online with Western Union is the same wherever you go, and is sure to be appreciated by whoever you have in mind.